Here at Hope&Glory we love all animals great and small – but there’s something about dogs that really do make them man’s best friend. Working with Mercure Hotels to promote their new “Happy Tails” offering, designed especially for pets, we partnered with expert Katrin Scholz (Head Nutritionist at natural pet brand, AniForte) to create a bespoke dog’s dinner menu especially for our four legged friends. 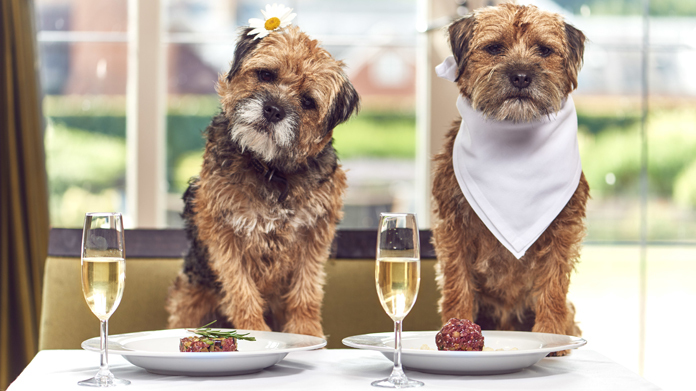 The doggy menu features a range of on-trend and nutritionally balanced meals for our pooch pals (including Salmon Sashimi and Beef Tartare), to ensure that pups are given plenty of delicious food options when staying at selected Mercure Hotels around the country. To launch the new “Happy Tails” menu, we created a series of fantastic imagery and video content to showcase exactly why Mercure Hotels are so well suited for pets – highlighting their excellent dog-friendly offering for owners and canines alike. Backed up by some expert research to show that a lack of pet-friendly hotel options leaves owners feeling guilty, sad, or even missing out on holidays entirely, we created a perfect solution to hundreds of pet owners’ problems across the UK. And it didn’t stop there – to top it off we even held an event for media and their pooches at Mercure Warwickshire Walton Hall Hotel, resulting in a weekend of fun-filled canine antics and lots of delicious doggy treats! Together with a snappy press release, we sold in our images to media and secured a wide range of national, regional, broadcast and online coverage – including titles such as Press Association, AOL, City AM (print and online), Daily Mail, The Sun, The Scottish Sun and the BBC news, to name just a few. A great result for pet parents everywhere!